Past Successes & References - Try the Auction Option! “I was appointed as a Personal Representative for an estate of an elderly couple, and needed to sell acreage, homestead and personal property. Doug and his team helped tremendously with this process in the liquidation of the estate, which can sometimes be an overwhelming experience. We had a well attended auction and were able to sell the remaining real estate homestead at the same time. I was so satisfied that I referred a customer of mine to Doug for the same type of services that I had dealt with and he too was satisfied with Doug’s work, friendly attitude and ability to get the job done!” -- Jodi S.
"Doug and his staff took all the worry and responsibility for the sale from our family. They handled the advertising, setup, food availability and even the portable toilets. Then took full advantage of every bidding opportunity to make sure we received the most value for the family's possessions." --Gary K.
"When I contacted Doug at Amazing Auctions for a estate auction in the fall of 2011, I very quickly found out how much i did not know about the auction process. Doug expertly-and patiently-led me through the process and always kept me informed each step of the way. I was very impressed with the work done by his crew getting things ready for the sale. All in all I was well satisfied with the out come of the auction that Amazing Auctions did for the estate that I represented and would highly recommend them to any one else. Also I heard many positive comments from numerous people that attended the auction." 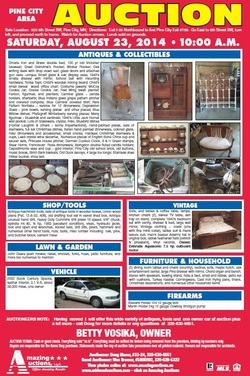 --Vernette C.
Auctioneers note: Nice winter sale, Ray has sold his home and is selling all these nice items at auction. If it is snowing and blowing we will hold the sale in large shed and garage. 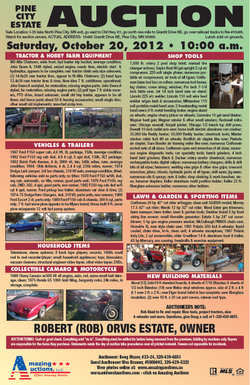 Any questions or if you would like more details on a specific item call Doug (320) 630-6651. Please note: there is no buyers premium. Directions from I-35 Hinckley MN exit - go East on St Hwy 48 go east About 21 miles to Alma Razor Rd go south about 1 mile to sale site. Watch for auction arrows. Lunch sold on grounds. Directions from I-35 Beroun MN exit #175 - go East on Beroun Crossing Rd about 2.4 miles to Cross Lake Rd, go South about 2 miles to Alabaster Rd continue 1.75 miles to sale site watch for auction arrows. Lunch sold on grounds. -Truck - 5th Wheel Camper. Sale location - I-35 Hinckley go west 6 blocks to Hwy 61 go North 6 blocks to Dahl Rd. go west 8 miles to Ct Rd. 20 go North and East then North about 5 mile to 340th Avenue go West about 1.5 mile to Uniform go South to sale site watch for auction arrows. Sale location -11500 110th Avenue, Finlayson, MN 55735. Directions from I-35 Finlayson MN exit, go west to Hwy 18/61 go North to Hwy 18 continue west about 7.25 miles to Ct Rd. 37 go West to T in road go SOUTH West continue to 11th Avenue to sale site LUNCH SOLD ON GROUNDS. Directions from I-35 Hinckley MN Exit - go east on Hwy 48 about 9 miles to Swede Alley go South about 1/4 mile to sale site . LUNCH SOLD ON GROUNDS. 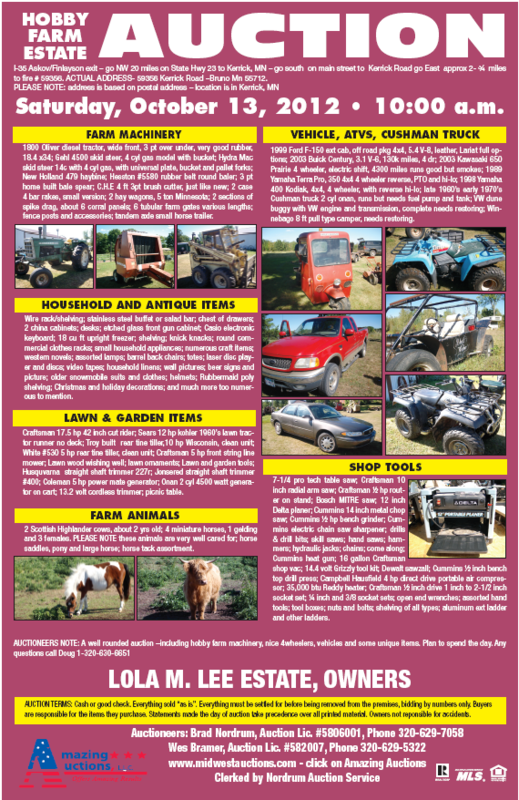 ​AUCTIONEERS NOTE: Nice simple sale -clean Farmall Super H- And collectible Case 311b tractor - Honda Rubicon - good DR trail groomers ​and tools and more. Hwy 18/61 go North to Hwy 18 continue west about 7.25 miles to Ct Rd 37 go West to T in road go SOUTH West around lake to Alder St continue to 111th Ave, go South to sale site. Lunch sold on grounds. Directions from I-35 Finlayson, MN exit - go west to Hwy 18/61 go North to Hwy 18 continue West about 5 miles to Cty. RD 37 go West to T in road go South on 38 and 110th continue going West to 116th Lane go West on 116th about 1/4 mile to auction site - watch for auction arrows. Lunch sold on grounds. Directions from I-35 Finlayson, Mn exit - go NE on Hwy 23 about 12 miles to town of Bruno - go over railroad tracks going East to Pine St, go North to Madison St to sale site. Lunch sold on grounds. Directions from I-35 Finlayson MN exit - go west to Hwy 18/61, go north to Hwy 18, thru Finlayson west about 7.25 miles to County Rd. 37, go west to T on road, go SOUTH west on County Road 38 around lake to Alder St., continue to 111th Avenue., go south to sale site or from Hwy 65/18 intersection go east 8 miles to Aitkin County Rd. 23, go south 1.5 miles to Alder St., go east about 1.5 miles to 111th Avenue to 117th to sale site. Lunch sold on grounds. miles to Fox Rd, go north about 3.75 miles to Buck Rd, go west 1 mile to Dove Rd, go south about 1/2 mile to sale site, watch for auction arrows. Auctioneers note: Nice fall sale. 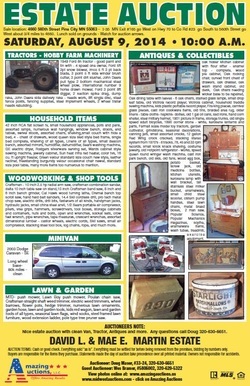 Joe has sold his home and is selling all these nice items at auction - there is not much for misc. 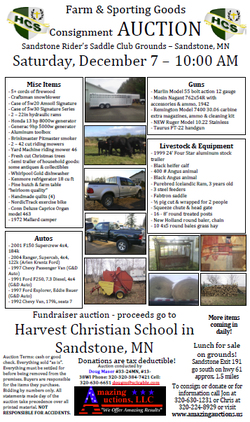 items at the sale - be on time - please note - auction preview dates of October 20th 3-6pm and October 21st 12 to 4pm. ​Any questions call Doug (320) 630-6651. I-35 Hinckley, MN north exit, go West on Hwy. 48 about 6 blocks, go north on Hwy. 61 about 7.5 miles to Pine Ct. 26 go West about 7 mile to 340th Avenue, continue West about 1 mile to sale site. watch for auction arrows. 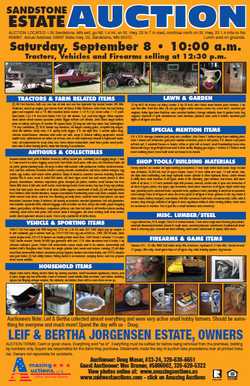 AUCTIONEER’S NOTE: Nice Fall sale with nice clean items. Any questions, call Doug 1-320-630-6651. Lunch Sold On Grounds. Directions: I -35 Willow River MN exit #205; go East on ct. rd. 43 to Walters rd. ; go North and East about 1 mile to River Trout Lane; go North to auction site. Watch for auction arrows. Lunch Sold on Grounds. ​AUCTIONEERS NOTE: Mitch and Linda have property for sale and are downsizing. Take a look at the neat list of items on this sale. Some good project vehicles and some parts vehicles. It will be an interesting mix of items. Hope to see you there! Any Questions call Doug at 1-320-630-6651. Directions: I-35 Pine City MN North exit #171; go West on Ct. Rd. 11 about 1/2 mile to Ct. Rd. 52; go South about 1.6 miles to Town Hall Road, go West about 1/2 mile to sale site. Gordon has sold his property and Closing is on May 25th. Any questions please call Doug 1-320-630-6651 Watch for auction arrows. Lunch sold on grounds. 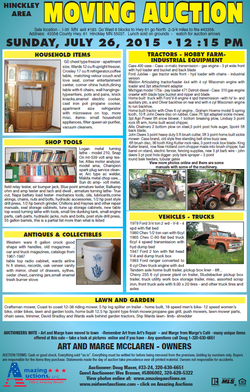 AUCTIONEERS NOTE: Nice Sunday sale with 2 nice tractors, shop tools, ​snowmobiles and a collectible truck. Any questions call Doug 1-320-630-6651. -Building Materials & Misc. items. 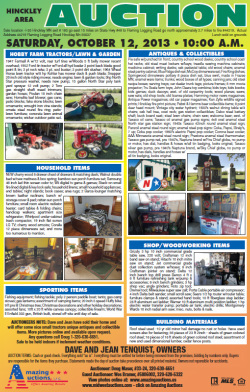 AUCTIONEERS NOTE: Arnie is moving - Nice hobby farm tractors - real nice 4 wheeler, lawn equipment and shop tools here - sure to be something for everyone- take a look at all the photos online any questions ​please call Doug 1-320-630-6651. Directions to the auction: I-35 Askov/Finlayson exit number 195; go West to HWY 61&18; go North to HWY 18; go West about 13 miles to Giese; go South about 2 miles to 120th; go West about 2.5 miles to auction site, from Intersection of state Hwy 65/18 go about 8 miles East to Giese go south 2 miles to 120 th go West about 2.5 miles. Look for auction arrow signs. Please note: If you need more details on an item or a picture, please call Doug at 1-320-630-6651. Auctioneers note: Take a look at this nice estate sale! 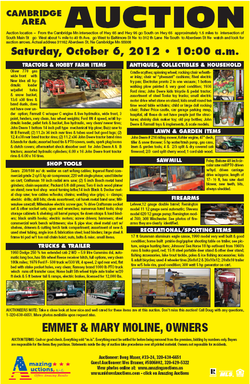 Tractors, implements, vehicles clean firearms, with a mix of antiques and collectibles of all types. Make plans to spend the day and be sure to view all photos online. Any questions give me a call: Doug 1-320-630-6651. I -35 Sandstone, MN; exit #191; go Southwest on Hwy 61 about 1 mile to Dupuis Rd; go South about 1/2 mile South to sale site. ​Watch for auction arrows. Lunch Sold on Grounds. 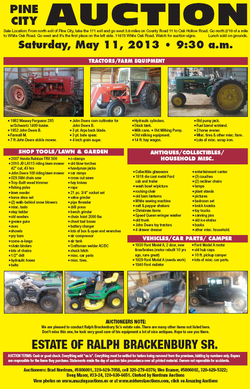 AUCTIONEERS NOTE: If you need a good tractor and some good hobby farm equipment and a nice camper with low mileage 1 ton truck - this is the sale for you. Take a look at all the photos online. Questions — Doug 1-320-630-6651. 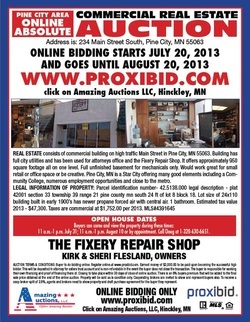 Proxibid: Auction items at 12:15 p.m. Address: 28184 Mallard Rd, Hinckley, MN 55037. Lunch sold on grounds. Sale location - I-35 Beroun, MN exit #175; go East on County Rd 14 about 3.5 miles to County Rd 15; go North about 3 miles to Mallard Rd; go East 2 miles to sale site. AUCTIONEERS NOTE: Wow! Nice assortment of farm equipment and grain bins. Please note there are set viewing times. Grain storage bins are approximate sizes. Also note that some items are live and some are online and live. Any questions call Doug at 1-320-630-6651. Hwy 61 & 18 go north to Hwy 18 go west about 13 miles to Giese go north about 1.25 miles to auction site. Auctioneers note - Wow what an auction! 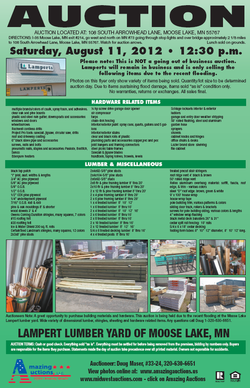 Please note there are proxibid items on this auction. 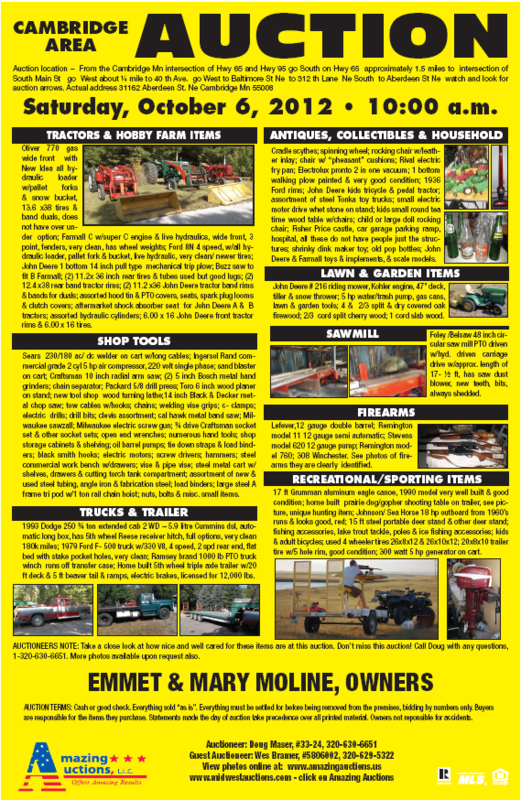 Construction equipment, collectible vehicles, skid steer, Antiques and collectibles of all types, and a nice mix of firearms also. Make plans to spend the day, bring a friend as we may need to sell in 2 rings. ​More information call Doug at 1-320-630-6651. Auction Terms: cash or good check. Everything sold “as is”. Everything must be settled before being removed from the premises. Buyers are responsible for the items they purchase. Bidding by numbers only. All statements made day of the auction take precedence over all printed material. NOT RESPONSIBLE FOR ACCIDENTS. Sale Location : I-35 Rock Creek, MN exit # 165; go about 1.25 mile East to Hwy 61; go South about 1.25 mile. 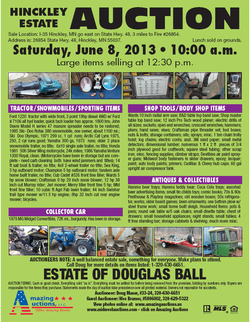 Address: 55447 Forest Blvd, Rush City, MN 55069 - Watch for auction arrows. Lunch sold on grounds. 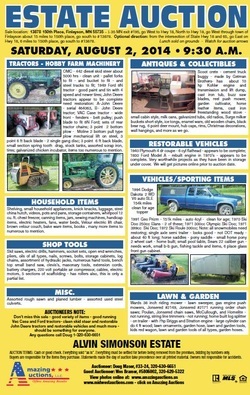 Auctioneers note: Interesting mix of items including restorable tractors. Nice Petti Bone with grapple loader and forks. Shop tools and some unique items. This is only a partial listing, more than what is listed, make plans to attend! Any questions call Doug 1-320-630-6651. I-35 Finlayson/Askov exit #195; go West to Hwy 18/61; go North to Hwy 18; go West about 10 miles to Sprandel Rd. ; go South about 1 mile. Or from State Hwy 18/65 intersection go East about 11 miles to Sprandel Rd. ; go South about 1 mile. Watch for auction arrow signs. Lunch sold on grounds. 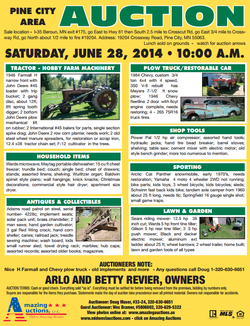 Auctioneers note: Nice Oliver tractors, small implements and collectibles! Nice Sunday afternoon sale! This is only a partial list, any questions call Doug: 1-320-630-6651.
go West about 3 blocks to property on right. and a very well maintained Brick home built in 1922 with character. Home offers original wood work, large rooms throughout. Full basement, newer mechanical, gas fireplace, two porches and room to grow. The kitchen has new granite counter tops, appliances included, also some unique features such as built in chest of drawers, and great closet space. It even has a loft for storage. I forgot to mention that it also has mature trees and nice flower beds and a large detached garage that measures 24 x 32 with a 3-season screen porch for entertaining. Additionally, to the North of the garage is a vacant lot for future plans, maybe a shed for your toys or a nice large garden. I-35 Hinckley, MN Exit #183; go west 6 blocks to old Hwy. 61; go North about 5 miles to Friesland Rd; go West to auction site -watch for auction arrows. ﻿I-35 Hinckley Exit#18; go west 6 blocks to old Hwy. 61; Go North about 4 miles to Happy’s Drive; go East to auction site. Watch for auction arrows. 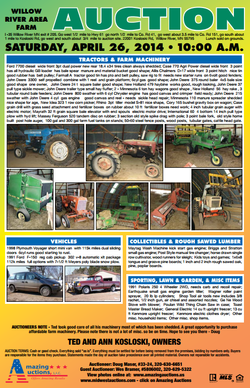 Auctioneers note: Very clean items, nice hobby farm tractor with implements. Kawaski mule truck and more! about 1.5 mile to sale site; Or from State Hwy. 18/65 intersection go East about 8 miles to Giese; go South about 1 .5 mile on 130th avenue to sale site. Watch for auction arrow signs. 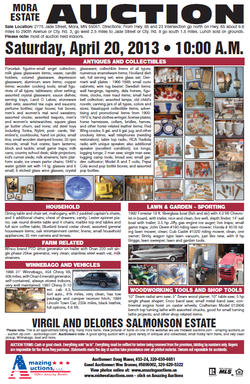 Auctioneers note: Wow what an assortment of wood working tools and items. 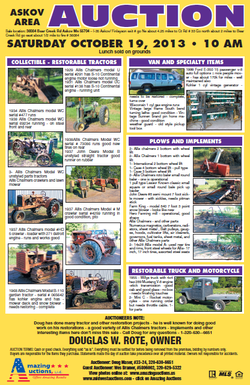 Nice older tractors, restorable vehicles and more! 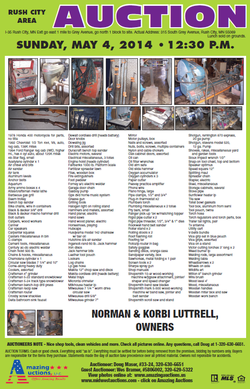 This is only a partial list, any questions call Doug 1-320-630-6651. Watch for auction arrows. Please Note: There will be off street parking no parking on State Hwy. 70. I-35 Askov/Finlayson exit #195, go West to Hwy 18/61, go North to Leese Rd., go East to Fire #2791 - watch for auction arrows. Lunch sold on grounds. Scale Model Collector Cars & Trucks. ​﻿﻿﻿Sale location - I-35 Pine City, MN exit #169 go about 3/4 mile East to Old Hwy 61, go North to 8th Ave NW intersection go East over railroad tracks to Co. Rd 8 also known as St. Croix Rd go Southeast to Co. Rd 9 also known as Cross Lake Rd SE go North about 3/4 mile to property on right. Lunch sold on grounds - Watch for auction arrows! Auctioneers Note: Great opportunity to purchase a one owner home close to Cross Lake - and Pine City- with large shed and nice lot- Some unique antiques and restorable car and a collector tractor. Any questions call Doug 1-320-630-6651. I-35 Banning Junction exit#195; go east and north about 4 miles to Askov MN; turn right on CT RD 32; go East about 2-1/4 miles to auction site - watch for auction arrows. I-35 Willow River exit, go west to Hwy 61, go north to Dago Lake road, east to Dobosenski Road, south to auction site Lunch sold on grounds - watch for auction arrows. This maybe a small sale but a good mix of interesting items, don't be late! Location: Sandstone Rider’s Saddle Club Grounds – Sandstone, MN. Sandstone Exit 191 go south on Hwy. 61 approx. 1.5 miles. 52820 State Hwy. 61 Sandstone, MN 55072. Lunch for sale on grounds. Livestock: Bottle calves and calves of various breeds, female Nigerian Dwarf Goats, chickens, broke riding pony, New Holland Lop bunnies, cow slaughter, hog processing and more coming in daily. Sale Location: I-35 MN Exit #183. Go West 6 blocks to Hwy 61 go North 2-3/4 miles to fire #43358. I-35 MN Exit #214 go Northwest on State Hwy 73 about 2.5 miles to intersection; go north to Moose Lake Hockey Arena. Watch for arrows. Lunch sold on grounds. We are down-sizing our collection of collectible treasures. Some very unique items. Don't miss this sale! This is only a partial list of items - plan to spend the evening! Any questions call Doug (320) 630-6651. Fund raiser to move Askov Depot to PCHM site. No Buyers Premium. Terms - Cash or good check day of sale. 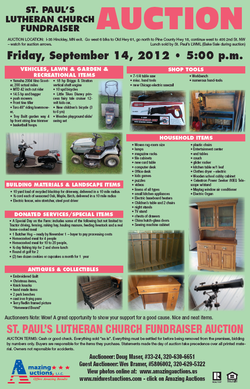 All items donated specifically given for auction. Items donated up to sale date. Check website, facebook and Craig’s List for updates. Auction inside and outside. Lunch available on grounds. ﻿Location: I35 MN Exit #191 go Northeast on St. Hwy 23, go east on Hwy 123 over railroad tracks to 3rd St and Hwy 123, go east to Ct Rd 30, continue east about 12.5 miles to house number 57324. I-35 MN Exit #191 go east on St Hwy 123 continue over railroad tracks to Minnesota Street by Chris Food Center go east to address. 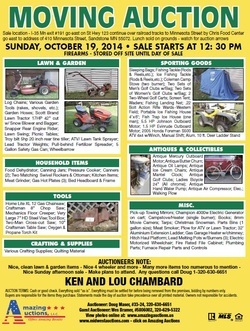 Nice, clean lawn & garden items - nice 4 wheeler and more - many more items too numerous to mention - nice Sunday afternoon sale - make plans to attend. Any questions call Doug (320) 630-6651. Sandstone Rider’s Saddle Club Grounds – Sandstone, MN. Sandstone Exit 191 go south on Hwy. 61 approx. 1.5 miles. Terms: Cash or check. Everything sold “as is”. Everything must be settled for before being removed from the premises. Buyers are responsible for the items they purchase. Bidding by numbers only. All statements made day of the auction take precedence over all printed material. NOT RESPONSIBLE FOR ACCIDENTS. For more information call Naomi at 320-372-0412 or Chris at 320-224-8929. 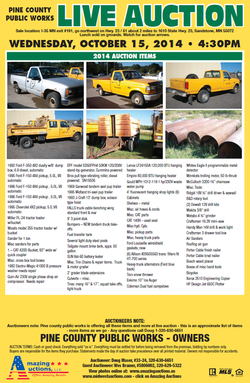 Pine county public works is offering all these items and more at live auction - this is an approximate list of items - more items as we go. Any questions call Doug (320) 630-6651. I-35 MN Exit #191 go West on Hwy 23/61 about 2-1/4 mile to Cty Rd 27 or Grindstone Lake Rd go west about 8 mile to Cty Rd 20 go north 1 mile to 365th Ave go east 1 mile to sale site. Lunch sold on grounds - watch for auction arrows. Nice Sunday afternoon sale - should be something for everyone. Any questions call Doug (320) 630-6651. Caruth's have sold their home and will sell the fore mentioned items at auction, all of which is in very good shape - should be something for everyone. Any questions call Doug (320) 630-6651. 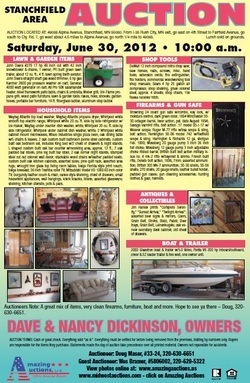 The Poor's have sold their lake home and as such, will offer the aforementioned items at auction - plan for a full day. 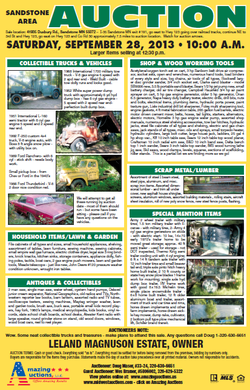 This is only a partial list of items - everything is very well cared for and there should be something for everyone. Note: Skid steer to be used day of auction for loading assistance - can be picked up after auction is complete. Any questions call Doug (320) 630-6651. Real Estate offered at 12:30 p.m.
I-35 MN Exit #195, go Northeast on St Hwy 23 about 18 miles to town of Kerrick MN. Go east over railroad tracks to 2nd Avenue, go east to #5366 and #5368. Auctioneers Note: A great get away - small town atmosphere - close to Nemadji State Forest, Oak Lake, and Banning State Park - many renovations - just needs the finishing touches on the historical property - should be something for everyone at this auction. Exit I-35 Northbound to first Pine City Exit #169. Go East to 8th Street SW, turn left, and proceed north to home. Watch for Auction arrows. Lunch sold on grounds. I-35, MN Exit #165 go West on Hwy 70 to Co Rd #23 go South to 560th Street go West about 3/4 miles to 4660. Lunch sold on grounds - Watch for auction arrows. Optional direction: from the intersection of State Hwy 18 and 65, go East on Hwy 18, 6 miles to 150th place, go south to #13878. Lunch sold on grounds - Watch for auction arrows. Lunch for sale on grounds! -More items coming in daily! 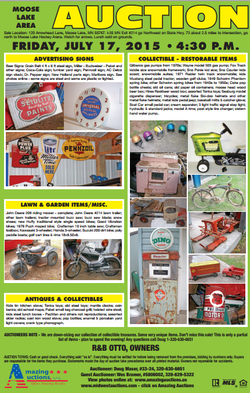 PREVIEW OF ITEMS WILL BE THURSDAY AND FRIDAY WEEK OF AUCTION NOON TO 7 P.M. EACH DAY. Real Estate & Business Liquidation. 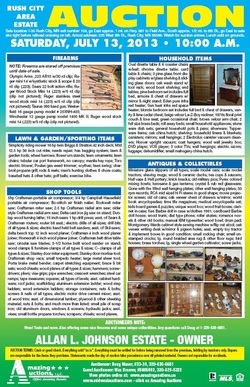 Rental items; Shelving; Party supplies; Special mentioned Antiques & Collectibles; Household/Sporting. Real Estate offered at 12-noon. Choose Quick Print to see open house information! 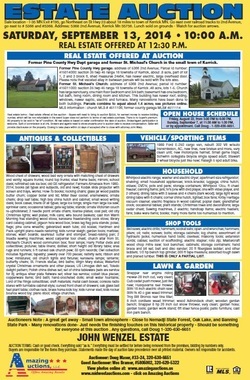 Orvis Estate: Tractor & Hobby Farm Equipment; Shop Tools; Vehicles & Trailers; Lawn & Garden & Sporting items; Household items; Collectible Camaro & Motorcycle; New Building Materials. 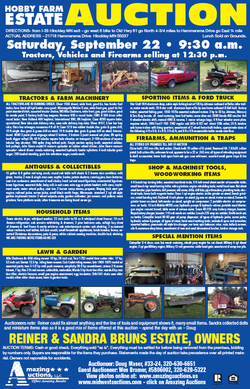 Hobby Farm Estate: Tractors & Farm Machinery; Sporting items & Ford Truck; Firearms, Ammunition & Traps; Antiques & Collectibles; Shop & Machinist Tools, Woodworking items; Household items; Lawn & Garden; Special Mention items. *Attention* Due to the amount of items at this auction, we will sell in two rings. Bring a friend! 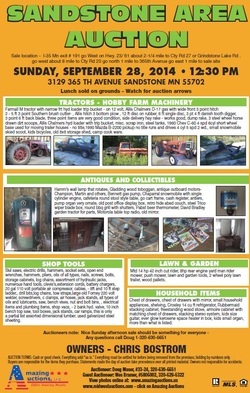 St. Paul's Lutheran Church Fundraiser: Vehicles, Lawn & Garden & Recreational items; Shop Tools; Household items; Building Materials & Landscape items; Donated Services/Special items; Antiques & Collectibles. 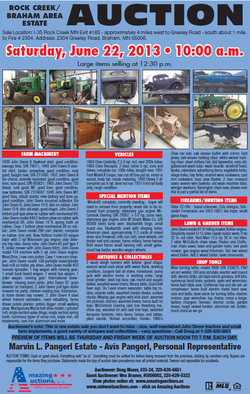 Jorgensen Estate: Tractors & Farm Related items; Lawn & Garden; Special Mention items; Antiques & Collectibles; Shop Tools/Building Materials; Misc. 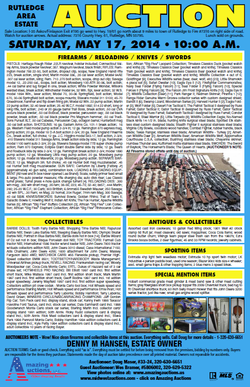 Lumber/Steel; Vehicle & Sporting items; Firearms & Game items; Household items. *Note: this is NOT a going out of business auction. Kuhlman auction: Household items; Lawn & Garden; Antiques & Collectibles; Tractors & Hobby Farm items; Shop Tools; Sporting items; Firearms (all stored off premises until sale date). 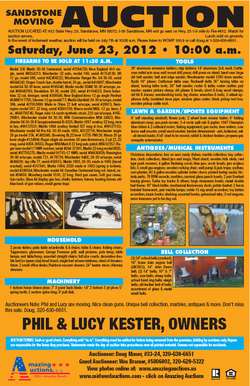 Kester moving sale: Tools; Lawn & Gardent/Sports Equipment; Antiques/Musical Instruments; Household; Bell Collection; Machinery; Firearms to be sold at 11:30. 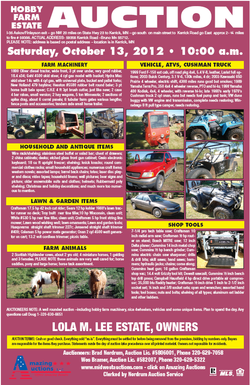 Marudas Estate: Suburban, Pickup, Tractor, Dodle Bug; Trailers, Campers, Lawn Sprayer; Power Shop Equipment & Tools & Misc. 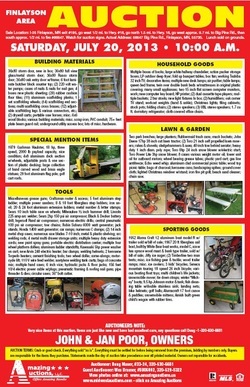 ; Snowmobiles & 3 Wheeler; Trailer House; Small Farm Machinery; Moter Scooter & Outboard Motors; Guns, Sports Items, Bicycles & Other Items; Household Items;Musical Instruments; Garden & Lawn Equipment & Snowblower. Pine City High School District #578 proudly presents for auction this year’s Building Trades class house. The 3-bedroom house meets all energy codes established April 1, 2006 by the state of Minnesota. The house measures 44 x 26 or 1144 square feet of living space. Energy efficient, oak doors & woodwork, Marvin Integrity windows, all rooms are telephone, cable and Internet ready, vaulted ceiling in living room, maintenance free exterior, and large patio door in dining room (deck ready). The house was sold by public auction on Thursday June 7th, 2012 at 6:00 pm. Opening bid will be approximately $36,000. School district reserves the right to reject any and all bids. 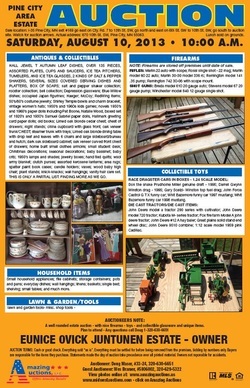 Edward Gustin, Owner: tractors & hobby farm equipment; lawn & garden equipment/boat; household items; shop tools; timeshares; firearms; antiques & collectibles. In memory of Dean Pederson: lawn, garden, shop, sporting; cookie jars; household & misc. ; dolls & children's items; lamps; clocks; antique & misc. furniture; vehicles; dishware & glassware; misc. antiques; metal/iron figurines. Click here to view pictures of all the wonderful treasures you could bid on! 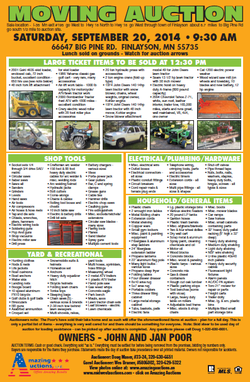 Farm; hand & power tools and hardware; household; sporting goods; yard & garden; firearms; commercial reel oven & freezer; trackers, crawler, vehicle, skid-loader. 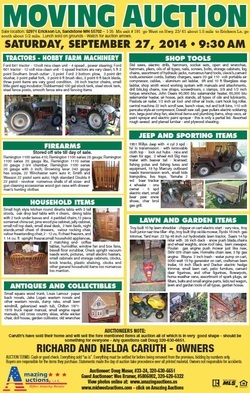 Donald Haare Estate, Deb Mell personal representative, Real Estate & Personal Property: Tractor & hobby farm items; shop tools, lawn & garden items; household/antiques & collectibles; recreational, camping, and sporting items; vehicles & bucket trucks. Klingle/Ronhovde Estate, McGrath Area: collectible glassware, enamelware, pottery & miniature items; collectible linens & clothing; antique furniture & wood items; unique antique & collectible items; general household items; collectible advertising & media items; lawn & garden shop items. Real Estate/Personal Property, Banta: real estate; logging equipment & sawmill; shop & woodworking tools; household items; lawn & garden; antiques & collectibles; and gas engines/fanning mill. Real Estate & Personal Property, La Victorie: household items; craft items; antiques & collectible; shop & lawn & garden items. 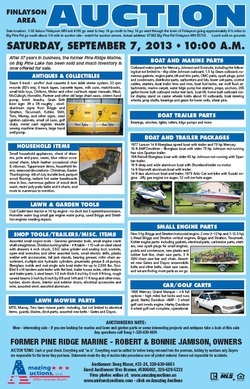 Personal Property, Ryder: equipment; antiques & collectibles; lawn & garden/sporting items; tools; household items; vehicles/4-wheeler/trailer; building materials. 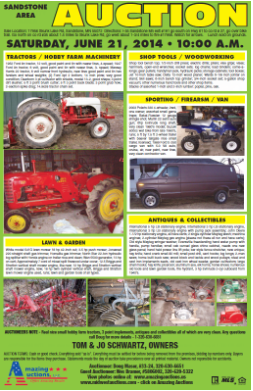 Estate Auction, Randall: tractors & farm machinery; collectible farm items; lawn & garden equipment; collectible (restorable) vehicles & motorcycles and parts. 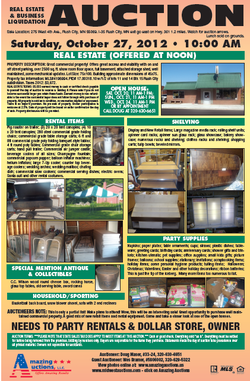 Grewe Auction, Real Estate & Personal Property: house; shop & woodworking tools; lawn & garden/sporting; firearms; household items; antiques & collectibles. 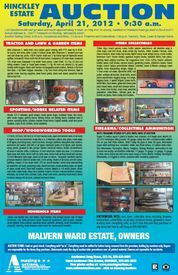 Behrendt/Siedow Real Estate & Personal Property, Rush City: shop & woodworking tools; lawn & garden tools, bicycles; vehicle & recreational items; antiques & collectibles; household items.